Popping into the room in his mother’s embrace, Yao Yuming immediately captured our attention with his shining large round eyes and adorable face. 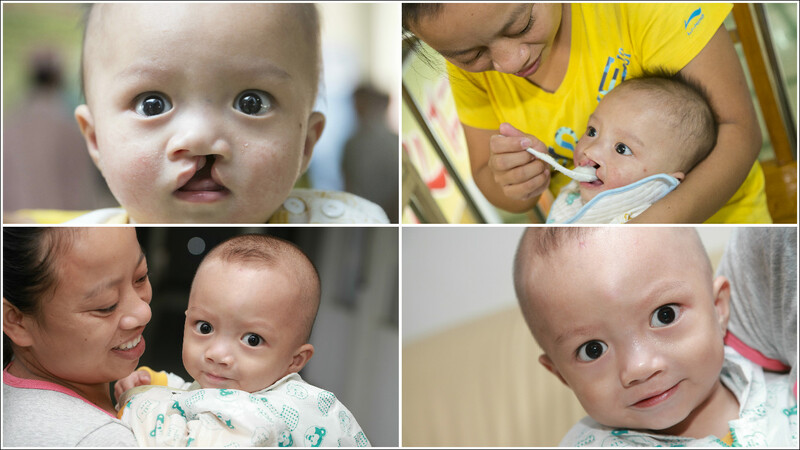 This 18-month-old boy looked so lovely that none of us could believe he was born with clefts, and was going to receive another surgery from us. “We want to thank for the care of all doctors, nurses and other volunteers, especially Dr Ding Guicong (丁桂聰醫生),” said Rong Liu (容柳), Yuming’s mother. Dr Ding was one of our medical volunteers who treated her son in Fengkai in 2014. A year later, they came back again from Wuzhou, Guangxi (廣西悟州), for the free palate surgery which would help develop Yuming’s speech in future. Rong was a furniture factory worker in Foshan, Guangdong (廣東佛山). She resigned when she was pregnant, and went back to the home town to wait for her first baby to arrive. Supposedly the happiest moment to see her newborn, Rong was desperate when she found Yuming having cleft lip and cleft palate which were not checked in prenatal test, and wondered why it happened on her. Some people consoled her that the advanced medical solutions could tackle this facial defect easily; yet others might give her little boy strange looks. Whatever, the surgery fee was a huge burden to the Yao’s family. “My husband and I are staying in the village to farm. Now, we are growing Indian jujube (蜜絲棗) which takes a whole year to yield, and nobody can tell whether the fruit would be sold. If not, we may earn not a penny despite all the hard work.” Rong shared the cruel reality of her farming life with us. Luckily, Wuzhou Red Cross told her that BEAM organised annual medical mission in Fengkai, so the couple put aside all the work to seek for our medical assistance. Rong’s family and neighbours were very happy with the Yuming’s new smile, and she hoped that the little boy could become a capable person to give back to society when he grew up.